Logo by Allen Jaeger, Jr. Imagine Wednesday Addams personified. Wednesday's Korner is not to be seen as strictly a tribute to the character created by Charles Addams, but more as an alter ego for a real person that happens to think and live the same way. She is as the verse describes: "Wednesday's child is full of woe." 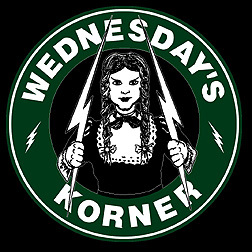 Christina Ricci's version of Wednesday Addams is a sufficient example of what Wednesday13, the Korner's author, is like. Please email me and make me aware of your miserable existence. Wednesday13 would cease to keep up the Korner without your support. Your comments really matter. Wednesday's favorite first lines. The title of the piece follows each line. hint: you're gripping the chair with fear when you hear his voice on the telephone in the movies Scream, Scream 2 and Scream 3.